Last updated on January 7 2018. GCE uses the Andromeda network stack which features DDOS protection. Snapshots and Images are available but are charged extra as storage ($0.026 per GB per month as of 5/8/2016). 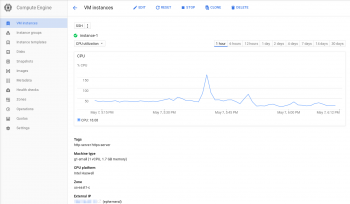 CPU, disk and network utilization. A tad complex but manageable. 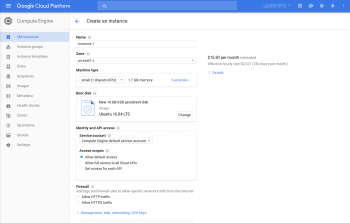 Block $0.170 SSD Provisioned space Called "Additional Disks" at Google. Object $0.026 Multi Regional Storage. First 5GB free. Object storage is called "Cloud Storage" at Google. The Screener shows all Google Compute Engine plans side by side with their grades in 5 categories. We conducted 5 different types of tests for Google Compute Engine - g1-small. Review the results and compare this plan to its competitors. This plan was tested 17 times at vpsbenchmarks.com. The table below shows all trials run on the g1-small plan and the web response times for every one of those. We conducted 5 different types of tests for Google Compute Engine - n1-standard-1. Review the results and compare this plan to its competitors. This plan was tested 3 times at vpsbenchmarks.com. The table below shows all trials run on the n1-standard-1 plan and the web response times for every one of those. We conducted 5 different types of tests for Google Compute Engine - n1-standard-2. Review the results and compare this plan to its competitors. This plan was tested 2 times at vpsbenchmarks.com. The table below shows all trials run on the n1-standard-2 plan and the web response times for every one of those.